In this dish, sweet and savory come together to transport you to paradise. Satay is perfect party fare – especially when served with peanut sauce – but we like it so much, we pair it with jasmine rice and stir fry vegetables for a light meal. Marinate the chicken overnight and you can have dinner ready in in 30 minutes! Soak skewers in water for at least 20 minutes to keep from burning on the grill. Mix together first 6 ingredients and pour into a container that seals well. Slice the chicken into long narrow strips and place strips in container with sauce. Let marinate in the fridge for at least 30 minutes. Thread meat like a ribbon on the skewers, alternating with pineapple cubes if using. BBQ on low on preheated grill until chicken is cooked through, about 15 minutes. We like to turn them every 5 minutes to keep them from browning too much on any one side. 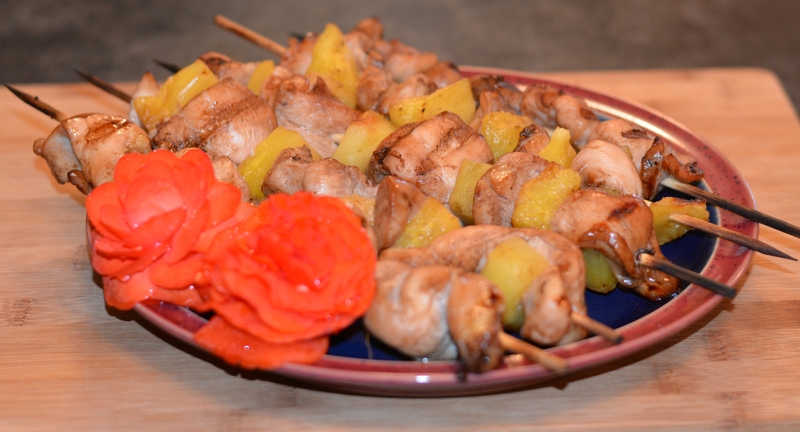 This entry was posted in Lunch and Dinner, Recipes and tagged BBQ Chicken, chicken marinade, chicken skewers, GF, gluten free, gluten free in Red Deer, shish kebab. Bookmark the permalink.